Food for Predators A butterfly colony looks like a bountiful source of food to a hungry predator. 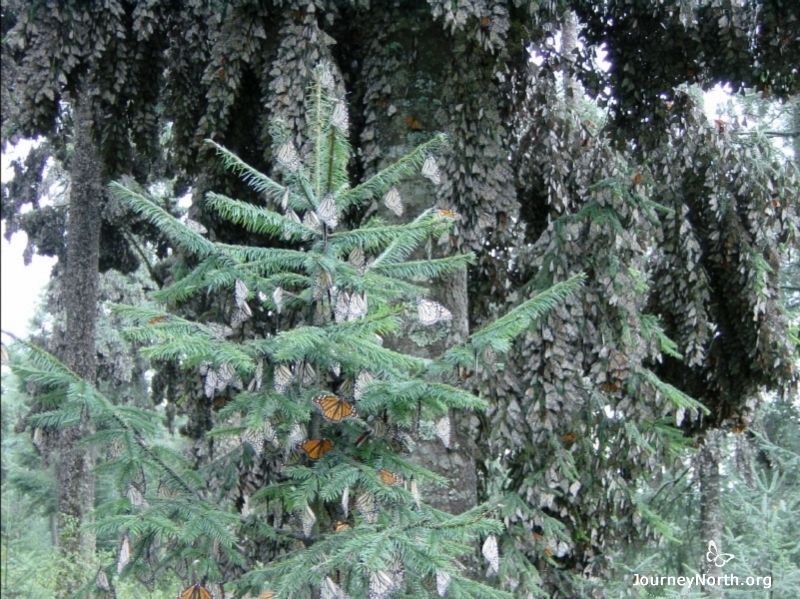 Each butterfly is full of fat, the stored energy it needs to survive the winter. A colony of 50 million butterflies contains as much fat as 1,500 pounds of butter. Protected by Poison Milkweed contains a chemical that is poisonous to many animals � but not to monarchs. Monarchs eat milkweed when they are caterpillars. The body of the adult monarch contains the poison it ate as a caterpillar. Most of the poison is stored in the cuticle (skin) of the butterfly�s abdomen. 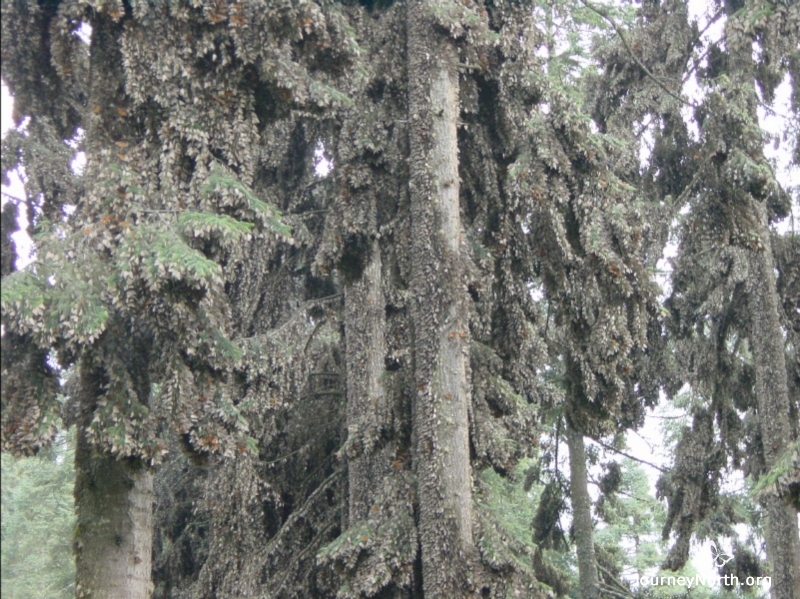 Identifying Enemies Dr. Lincoln Brower and his research teams worked for many years to identify the monarch�s enemies in the winter sanctuaries. The scientists discovered three main predators. 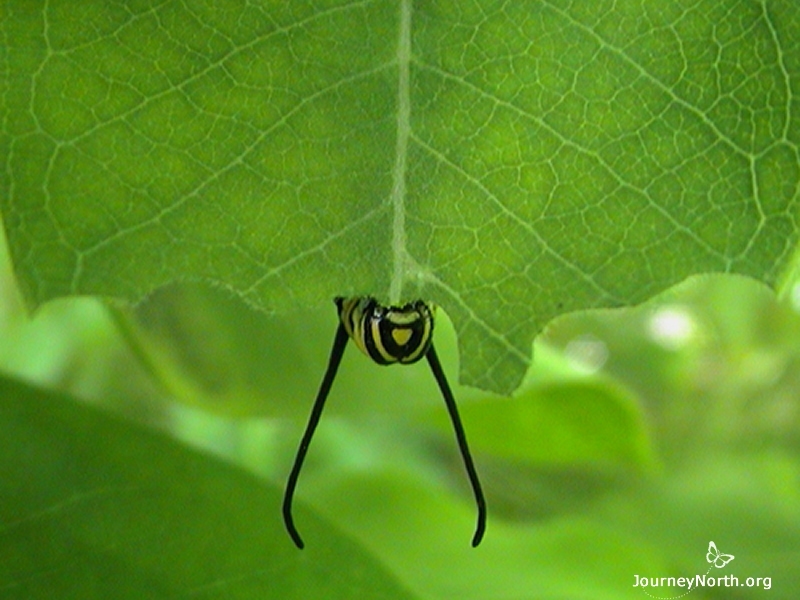 Each predator has its own method of eating a butterfly, so leaves clues that reveal its identity. Mice Eat Monarchs Mice feed at night. They will eat living, dying, and recently dead butterflies that they find on the ground. 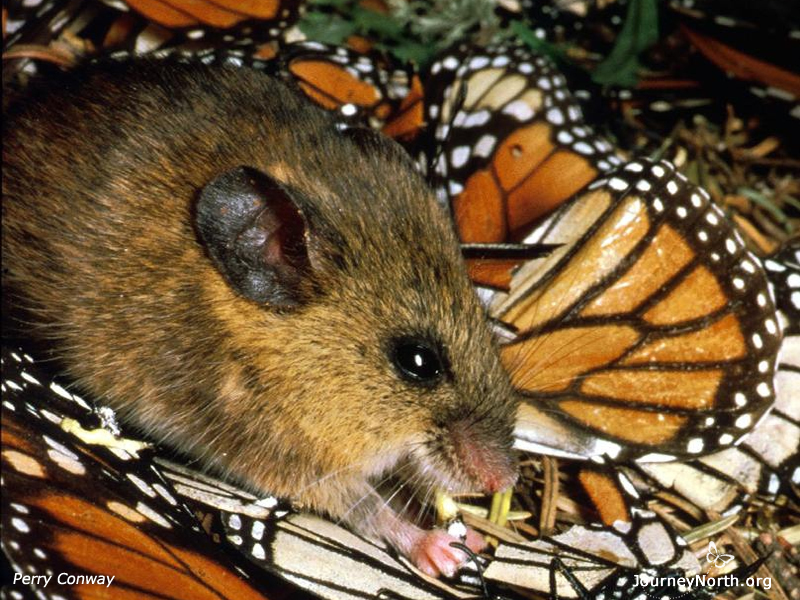 There are 4 species of mice in the area, but only one is known to feed heavily on monarchs. The Black-eared mouse (Peromyscus melanotis) is evidently not hurt by the poison. One mouse can eat about 37 monarchs a night. Mice leave a pile of wings on the ground. Orioles Eat Monarchs Black-backed Orioles prey on monarchs. The Orioles avoid the poison by not eating the cuticle where most of the toxins are stored. 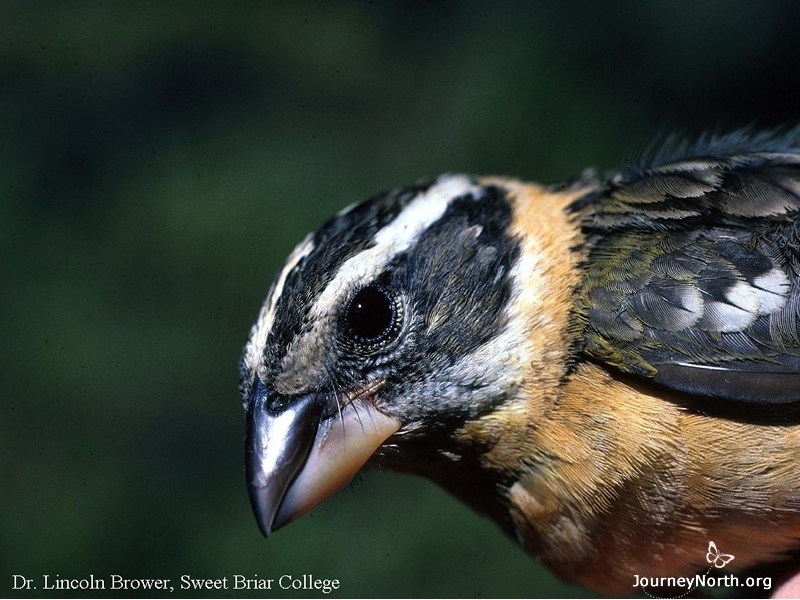 An oriole uses its sharp beak to slice the cuticle open, and then eats the fat inside. 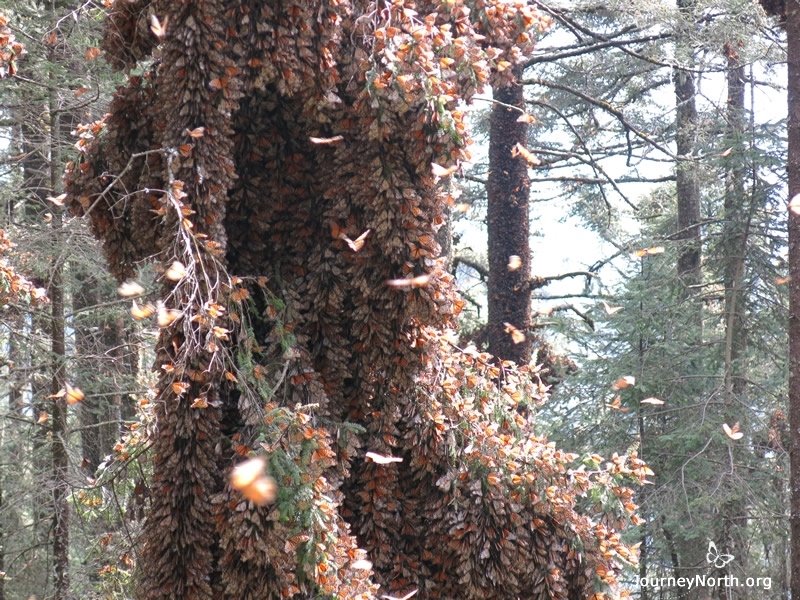 The birds feed on monarchs in the morning and evening, when the butterflies are too cold to fly. Grosbeaks Eat Monarchs It's easy to tell when a Black-headed Grosbeak ate a butterfly. The monarch's entire abdomen is missing. Grosbeaks do eat the cuticle. 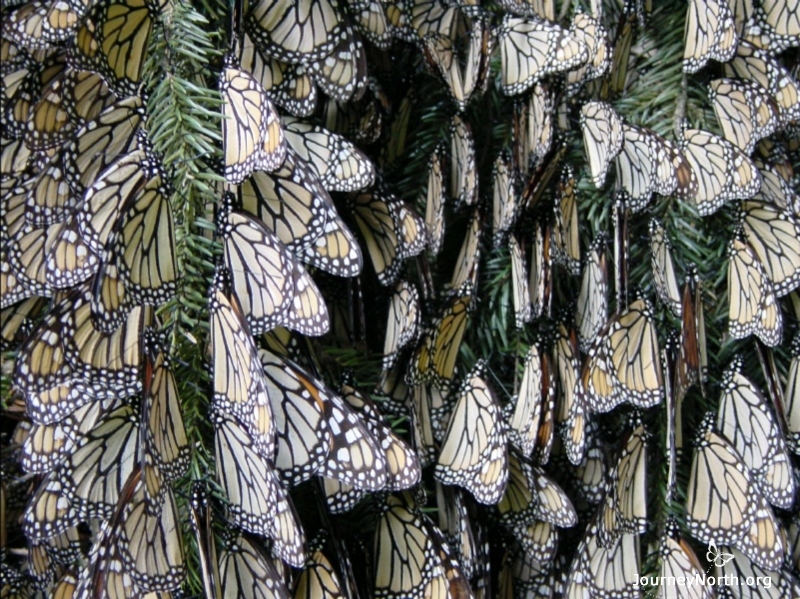 However, they selectively eat male monarchs who have 30% less toxins than females have. 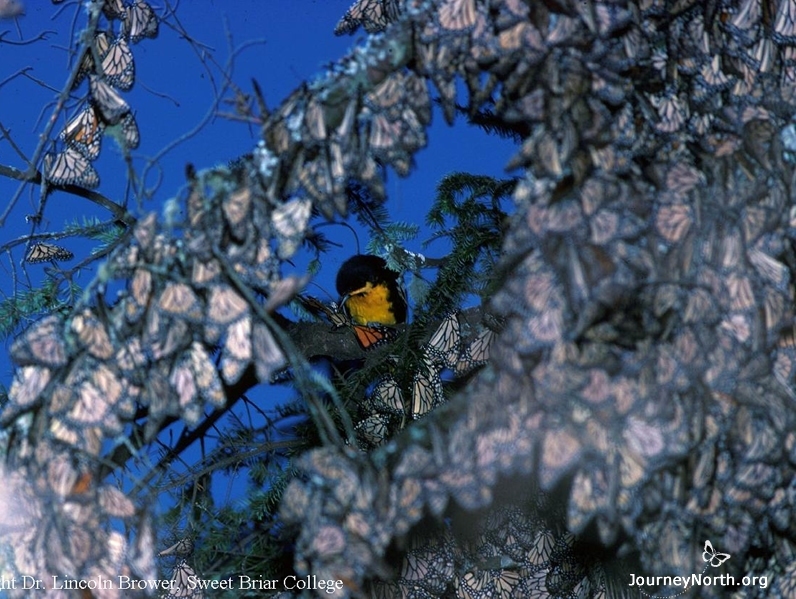 There are 37 bird species in the region that eat insects, but only the Oriole and Grosbeak prey on the monarchs. 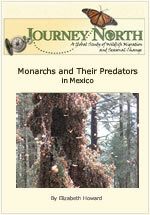 The Impact of Predators Millions of monarchs are eaten in Mexico. The ground under a butterfly colony is peppered with wings by the end of the winter. More than 15% of the entire overwintering population is killed by predators in a typical year, according to one estimate. Safety in Numbers Beyond protection from poison, monarchs have other ways to defend themselves. "Forming a colony is clearly an anti-predator strategy," says Dr. Brower. "The probability of any one butterfly being killed is lower if the individuals aggregate, or group together." 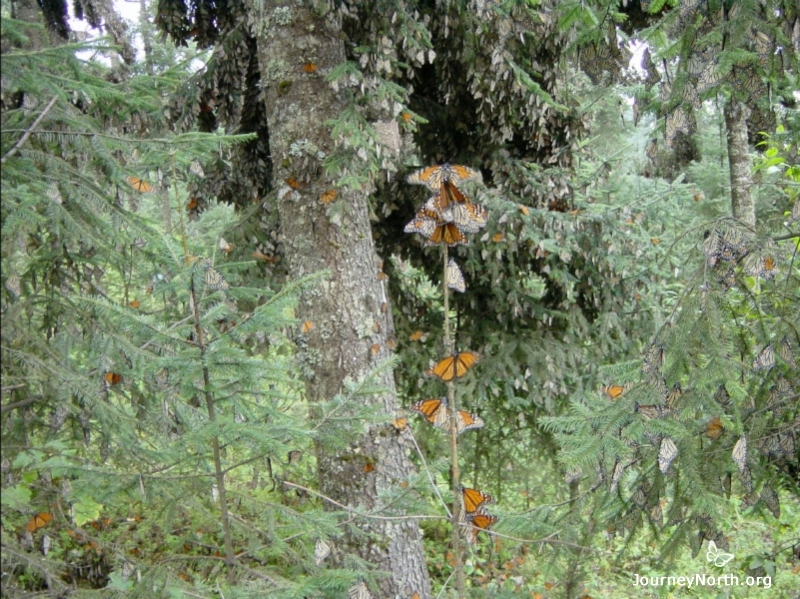 Climbing and Flying to Safety Monarchs are vulnerable when they�re on the ground and cold. They can�t crawl until their muscles reach 41�F or fly until they reach 55�F. 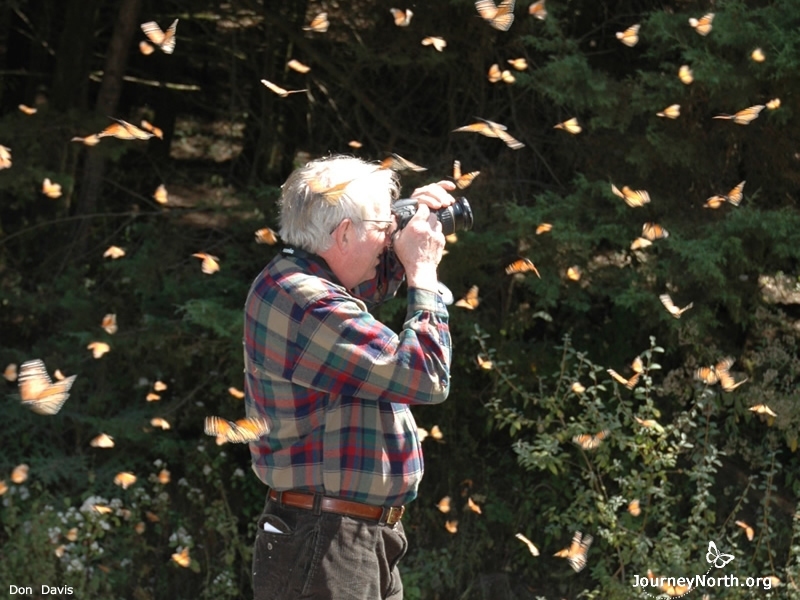 �Monarchs will struggle to fly to the trees � or crawl to the nearest twig � for safety. Quiet and Camouflaged When at rest, monarchs are hidden in the forest by their stillness, their silence, and their coloration. The bright orange wings are closed. The wings� undersides are dull and match the bark and lichens perfectly. Silent Self-Defense Millions of motionless monarchs appear vulnerable in the colony, but the butterflies can defend themselves powerfully and effectively. 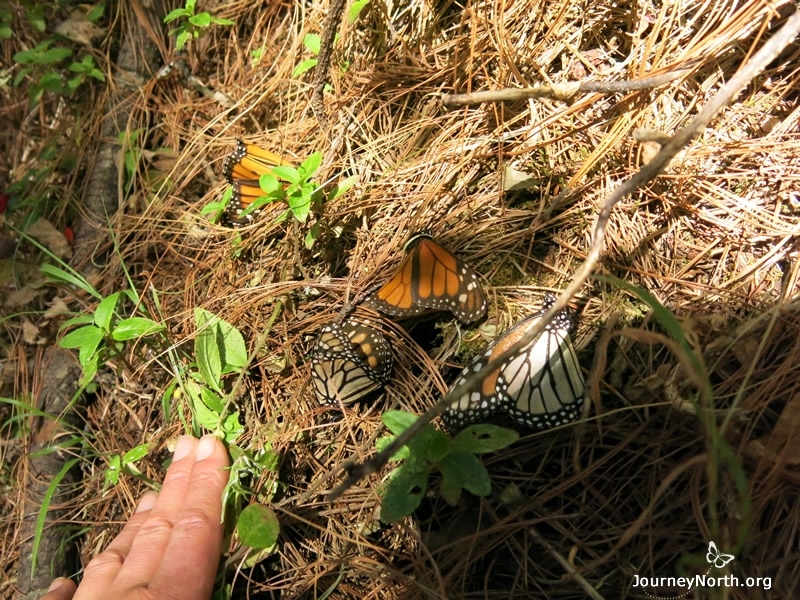 Who are the monarch's predators in Mexico and how do the butterflies defend themselves?